Cheap Paving Slabs For Patios – Clearance Sale Prices! We’re always on the lookout for good quality garden products at low prices. We know consumers will inevitably find the best deals online, which is why we try to regularly find and share the best deals with our readers. And this is one such post! With the latest exclusive offer from EMU Trade, you can get high quality patio slabs with some seriously cheap prices – including fast, free UK delivery! That compares to a typical price of between £15 – £20 per slab that you’d usually pay at B&Q or Wickes for the same level of quality, without the hassle of loading very heavy slabs in and out of your car. In short – yes! Marshalls are the industry leader in the UK, known for their quality and longevity. These flags are 50mm thick – thicker than most of the traditional slabs you’ll find at B&Q or Wickes (where flags are typically 32mm thickness). This means they can withstand huge amounts of wear-and-tear without splitting or chipping. With free home delivery it also means there’s no heavy lifting required. A flat bed lorry will drive to your property and deliver the slabs using a crane, allowing you to move them at your leisure. All patio slabs are the same thickness (50mm). Unfortunately, the flags are not sold separately, so you’ll need to make the best use of the slabs to your nearest multiple. 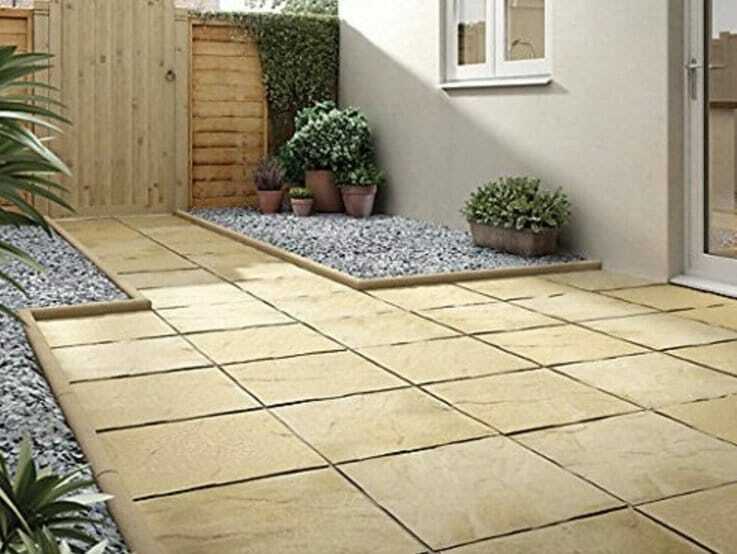 If you’re looking for more of a yellow-ish hue, you might also want to check out the pendle buff paving slabs which are available individually here. Granted these slabs are fairly plain, meaning you might be looking for more decorative options if you’re quite picky. However, they make for the perfect base for a shed, greenhouse or hot tub. They also work incredibly well alongside decking. If you’re looking for a cheap yet sustainable option for decorating your property you can’t go wrong. Patio flags are easy to place with or without a binding substrate depending on whether you’re building a walkway or a driveway. Obviously they come in a wide range of shapes and sizes, but a common characteristic of all models is their weight. 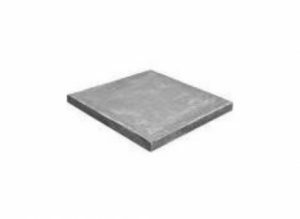 A standard 60x60x2cm slab weighs about 17kg – a mass that provides excellent stability when laid on a levelled ground without the use of adhesive and joint filling, depending on the circumstances. On a cement base, it is even possible to create a raised pavement with telescopic pedestals that support the slabs. This is a rather unusual but innovative solution that gives homeowners the capability to create a levelled walkway or patio on an uneven terrain. The pedestals, fixed or adjustable, are made of recycled polypropylene designed to resist to weather elements, acids, and other harsh materials. Adjustable pedestals are self-levelling and able to compensate slopes of up to 10%. All models have a grid that acts as a guide, helping to place the slabs in a central position. To lay the slabs, clean the surface and place as many pedestals as necessary to sustain your pavement. Each slab needs at least four pedestals to support the corners and edges, and at least two to sustain the centre of the plate. It’s unnecessary to fix the slabs to the ground. Lay the dry slabs on the pedestal, checking with a bubble leveller that the surface is plane. Regulate the height of each pedestal as required. This pavement has many benefits. The space under the slabs is easy to inspect and can hide any unsightly installations, the 3-4mm joint space provides excellent water drainage and the slabs can be dismantled and reused for other projects. Screed and slab adhesive are two strong materials that can keep the pavement in place in highly trafficked areas, such as a driveway or in front of the garage. For this project, you’ll need a state-of-the-art executed, dry, stiff, and plane surface to lay the paving slabs on. Mix the binding substrate as shown on the product’s package. Spread the material evenly with a dented spatula; work on small portions, spreading adhesive and laying one slab at a time. Once in place, beat the slab with a rubber mallet and proceed with the next slab. Use 4mm or 5mm spacers between pieces to maintain even joints. When all slabs are in place and the adhesive has dried, remove spacers and fill the joints with the joint filling material. Clean excess material with a sponge, removing all debris and dust. Once laid, the pavement is perfect for drive-over surfaces; it doesn’t absorb dirt or oil from car tyres, and it’s possible to clean the slabs with a high-pressure jet. To dry lay slabs all you need is a bedding layer such as sand, gravel, or grass. No binding substrate is involved, the slabs are easy to dismantle and reuse, and you’ll be able to redesign your outdoor space at any moment. Arrange the slabs on the area to be paved, determining the layout and defining the portion of soil to remove. Remove the soil with a shovel at a depth of 5cm and fill the space with a 3cm thick layer of gravel. Place the slabs on top of the gravel and beat with a rubber mallet. Check if the surface is plane with a bubble leveller and adjust accordingly. The pavement is quick and easy to install; the gravel provides an effective water drainage, and this solution is ideal for a backyard or garden. Define the area to be paved following the steps above. Dig the soil at a depth of 20cm and pour a layer of gravel of about 10 cm. Add 5cm of construction sand on top of the gravel, then fill the remaining space with a layer of fine sand. Level the surface with a plank and lay the dry slabs measuring the distance between them with a ruler, to keep it even. Once laid, beat each slab with a rubber mallet and fill the joints with fine sand. This is another easy-to-install pavement, dismantling it is a breeze, and the slabs can be reused in other projects.